EZ CD Audio Converter is optimized for best possible audio quality and high-performance ripping, encoding, and burning. It includes all the best audio codecs. Audio conversions are made with 32-bit float accuracy. Supports multi-core processors and runs up to 8 parallel converters. Accurately rips audio CDs with error detection with its AccurateCDDA CD-ripping system. Detects pre-gaps and pre-emphasis. Reads CD-TEXT, CATALOG, and ISRC properties of an audio CD. 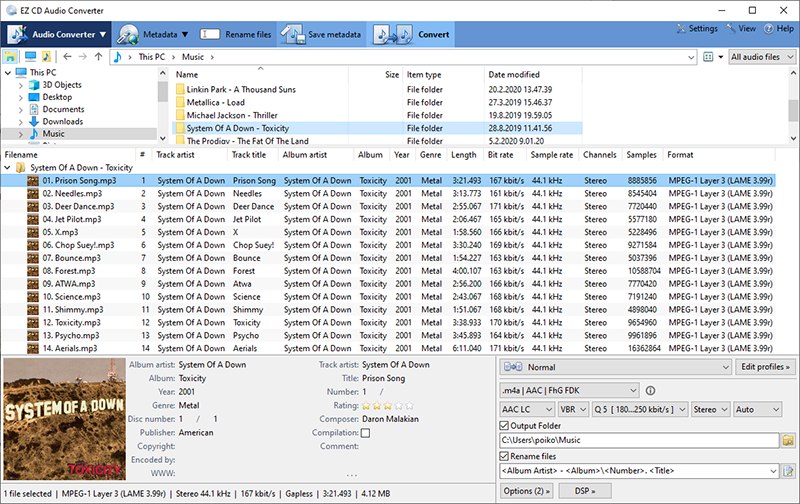 Metadata can be manually edited or automatically downloaded with high-resolution cover art using multiple Internet disc databases. Supports ReplayGain calculation and normalization. Bypasses audio CD copy-protections. Supports single-file and multi-file Cue Sheets.